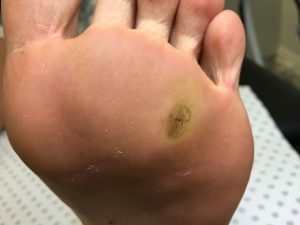 Warts, plantar warts or verruca are a benign thickening of skin caused by human papillomavirus infection. They are often painful and most common in children and teenagers but can occur in all ages. Tendonitis involves inflammation and pain of the sheath surrounding a tendon. When force is particularly large or is repetitive over a long time a tendon can strain or even tear. Tendonitis can develop in any of the tendons of the foot and ankle. The more common sites that tendonitis will develop include the tendon that; attaches to the back of the heel bone (Achilles tendon), supports the inside of the arch (Posterior tibial tendon) and supports the top of the arch (Tibialis anterior tendon). If not treated tendonitis can weaken the tendon leading to rupture. 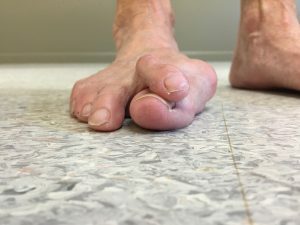 This condition occurs when the big toe bone deviates towards the little toe and the metatarsal bone behind the big toe moves away from the rest of the foot. The big toe joint then becomes prominent which can make it impossible to walk or wear shoes with comfort. The medical term for this condition is hallux abducto valgus. A neuroma develops when the protective coating that surrounds a nerve becomes thickened and scared. This is called a Morton’s neuroma when it occurs in the nerve that runs to the 3rd and 4th toes. However, neuromas can occur in the nerves that supply any of the toes or elsewhere in the foot and ankle. Neuromas cause burning, cramping, shooting and sharp pain in the ball of the foot which often extends into the toes. An ingrown toenail occurs when the edge of a nail becomes embedded into the surrounding skin. This can cause excruciating pain and often becomes infected. This condition is very common in teenagers but occurs across all ages. Ingrown toenails always require treatment in order for a patient to be comfortable. 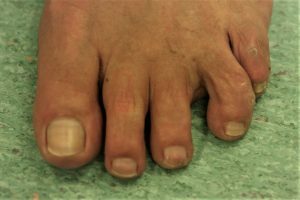 However, in patients with diabetes or poor circulation significant risk of toe, forefoot or below knee amputation can occur if ingrown toenails are ignored.